I can still remember when I first met Amy. We were both new to the wedding photography industry. In the early days of our friendship, Amy and her husband, Matt, had a group of photographers over to their place to chat about accounting. A topic that doesn't thrill a lot of small business owners, but these two somehow made it a fun and memorable one for me. They are the type of people you can't wait to spend time with, as it will be sure to be filled with engaging conversation and a lot of laughter. Amy's positive outlook on life rubs off on everyone she meets. Fast forward almost 6 years later and their family is thriving with the addition of two little ones. 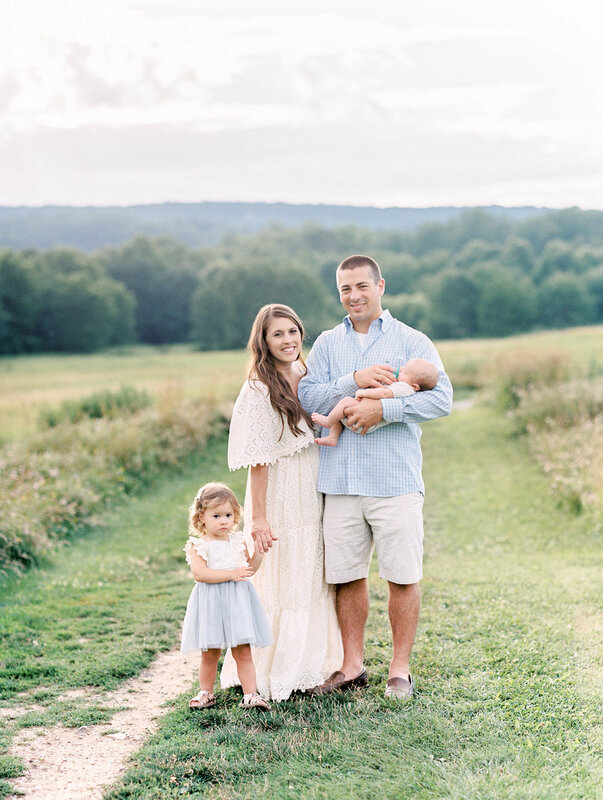 I had the pleasure to document their adorable growing family this past Summer. We started out at their home in New Jersey and then ventured off to a park in Morris Plains, NJ that they frequent. With a breathtaking view of the sunset, I can see why it is a special location for their family. I hope the next time I see this foursome isn't nearly as long as the last gap. I miss the old days of our constant get-togethers and business/life chit-chats!